“After hours on the couch playing Shadow Brawlers with our friends, we took our joysticks to Pax West, IndieCade and EVA 2018. There, we were able to see how others lined up, smack-talked and excitedly hid in the shadows, dashed, and beat up other ninjas. That's why we simply can’t wait any longer give access to the game to all players who want some stealth brawling fun! Just grab some friends and get ready to for some mad-dash fun. *Couch sold separately. 2 - 4 -player fighting game. Dynamic 2D lights, lights change in real time! One hit kill will have players on the edge of the seat. Single Player Training Mode with 26 levels. Robot enemies for single player stealth levels: Basic bot, Flying Eyeball, Turret. Highlights of the matches! (kills on deathmatch, steals on The Heist). Can be replayed on slow-mo and rewind. 26 arenas in 6 different worlds, each with their own special features. 14 Unique skins. Includes 3 illustrations for each character (selection, win and lose). Lots of palettes (like, lots) that affect almost everything in the screen. Configurable game modes. You can switch-off the lights, disable the “camouflage”, change points needed for win, number of weapons and activate the option of choose your weapon, powerups, enabled disable worlds, etc! Gamepad and Keyboard support with key bindings. Unlockable modes, weapons, skins, worlds and other features will be unlocked as you play multiplayer matches. Special tie breaker combat stage. Results screen with the illustrations of the characters. NOT online. Won't be online. Don't insist. Fast-paced stealth 4-player fighting gameplay. Players can blend into the background for sneak attacks. Dead characters can help reveal other characters position! 4 main skins, 4 hidden unlockable skins. 14 Levels for Multiplayer Mode (6 unlocked + 8 to unlock). 19 Levels for Single Player Training Mode. 1 basic attack and 3 special weapons (Katana, Bow & K4M1). 2 Multiplayer PowerUps (slow-mo and Extra life). Levels with reactive physics and environmental traps. We’d love for the community to name some of the characters! We´ll do some Q&A sessions with their favorite characters. Simple comics about the life of the bots and characters. We’ll post topics on Steam forums by subject so we can talk about what makes the game fun or what could make it even more fun. Level Design, music and sfx. We are excited to announce that Early Access is now a reality for you to take. Get a bunch of friends and joysticks (and a computer can come handy too) and play the heck out of Shadow Brawlers. If you like it, please give us love in the form of positive reviews! 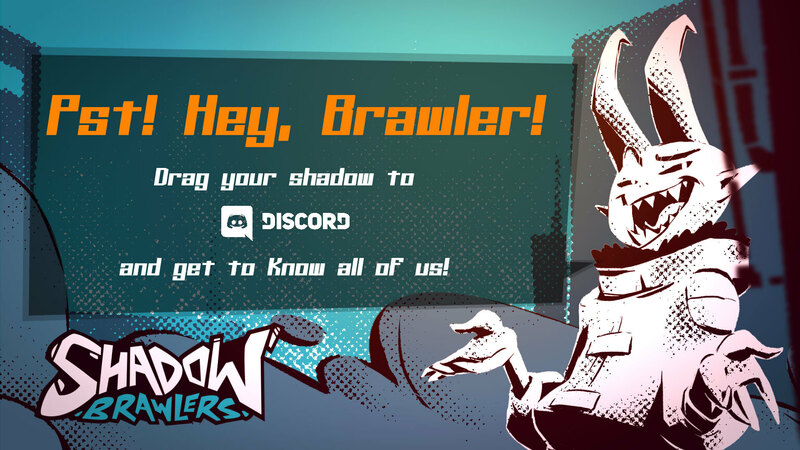 Shadow Brawlers is in Discord! 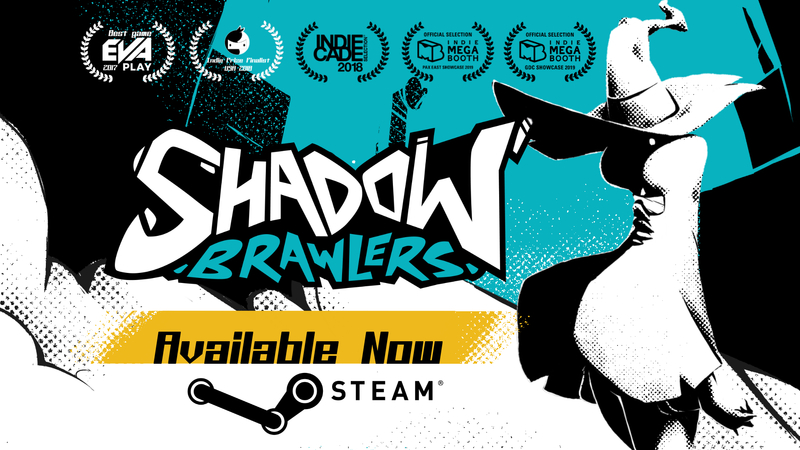 Shadow Brawlers is a local party game in which players control cute, agile ninjas that hide in the shadows. Surprise your opponents by appearing suddenly from the background; attack and disappear in this fast-paced, award-winning brawler. The game features elements from the classic platformer genre mixed with the modern party game rhythm; a combination that results in players throwing elbows in acts of undisputed sportsmanship. With lavish animations, a super stylistic design, and hyper-fast gameplay that will test the reflexes of the gamers, Shadow Brawlers is poised to set the fighting party games genre ablaze. The players can change the color of their characters in order to blend with the background. Dead characters can use their souls to reveal living characters position! 5 Play modes, including Single Player. Multiple weapons and play styles to fit any player. Levels with environmental traps that will have players on the edge of the seat. Copyright © 2018 . Guazú Team. All rights reserved. Published ℗ 2018. Inca Games Publishing B.V. All rights reserved. This videogame is protected by national and international copyright laws. Reproduction and distribution of this videogame without written permission of the owners are absolutely prohibited and may lead to criminal and/ or civil liability.